Rest Areas: Caroline explained that in a busy painting, rest areas are needed for the eye to process the picture. Rest areas are often part of the background or could be a road or a lane in a landscape. Pets If painting from a photo it is essential to find a good picture with relevant information. Using a photo, for example of a black Labrador could leave you struggling with the detail. Also consider the character of the animal. If this is known you can add specific details, such as pet toys to the background. Too often people just paint an animal floating on the surroundings, so do consider the background carefully to match the pet’s character. Caroline was working from a phot of a tabby cat she had found on the internet. She had worked a good grounding and wanted to show us how she refined the details. 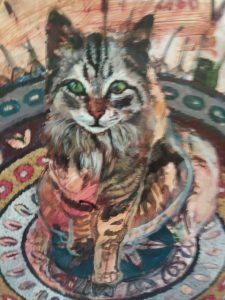 She had made up a rug background, but she was not entirely pleased with it and as the cat looked quite young, she was intending to include fishes in the rug design to suggest a sort of playful character. These colours were often slightly altered through the painting by adding more or less of the above colour palette. Brushes: Caroline showed us the brush she often found useful. She had an old flat acrylic brush and had cut into it to leave it with spikes. Thus she could produce scratchy hair-like marks. Other brushes used were small acrylic ones and a rigger for refinement. She proceeded to work on the cat’s face, often using the side of the brush. Painting dark to light and working in layers with paint, neither too thick nor too runny. The fur on the upper leg was painted in with light brown over a dark base she had applied first. The brown colour adjusted by mixing as she went along. The final process today was to use the rigger to define the hairs. Caroline also uses dragging one colour into another and to soften the area she might use a glaze. Viridian, Cadmium Red, Cadmium Yellow for a lighter shade. She worked around the outer part of the iris first, in dark colour. Then she used the lighter green for the middle. Finally, picking out the pupil in black and lastly giving attention to the shadow under the eyelid and highlights in the iris with a dot of white.